She urges Chloe to talk to Uncle Bobby, and he reassures her that she will always be his special girl, even if he and Jamie have kids of their own. Meanwhile, she grows to appreciate Jamie, and decides she wants him to be her uncle too. Highly recommended! Priced at $15.99 and great for kids ages 3-6. 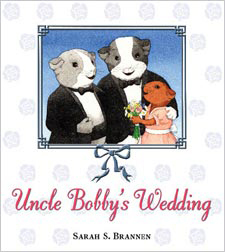 Thanks for sending me the Rainbow Babies newsletter, and thank you so much for the feature on Uncle Bobby’s Wedding. As far as I know, the book has not been banned in Colorado, certainly not at the library in Parker, but challenged. A formal challenge usually means a library patron has asked that a book either be removed from the library or shelved in a special area. Jamie Larue, the librarian in Parker, refused to take it off the shelf, as his letter explains. However, if it had been banned elsewhere I might not have heard about it. The book was also recently challenged at a library in Gainesville, FL; I have no other information. A protest against a teacher reading it in class was also filed at an elementary school in the Washington, D.C. area. A friend also sent me a letter to the editor of the Post-Standard in Syracuse, NY, in which a reader protested a positive review the paper had printed. I’m doing my best to keep track! Should you hear of any other challenges, I’d really appreciate it if you let me know. Eventually, my agent may send out another press release.